Downtime in critical operations from a broken conveyor, out-of-order dock lift, or malfunctioning packaging machine can be incredibly costly. 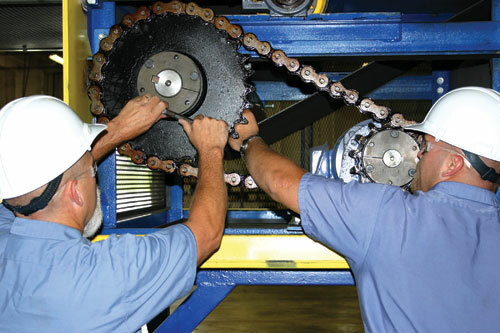 Our factory-trained technicians help keep your equipment running at peak efficiency and reduced downtime. We perform repairs and service, and provide replacement parts for a wide variety of equipment, ranging from conveyors and lifts to vertical carousels and dock equipment. We execute electrical work, mechanical services, and other types of specialized work. Contact us today for assistance. Scheduled preventive maintenance programs help limit downtime from breakdown by making you aware of potential parts & equipment failure before it happens. Call us for reconfigurations, space consolidation or plant moves. We respond quickly and effectively.